Last December 2012, Bacolod City Administrator Atty. John N. Orola, Jr. announced the planned resumption of international flights from Seoul, South Korea. This is in response to the improvements of the key golfing facilities in Bacolod City, citing complaints posted previously by the Korean tour company. However, the Bureau of Immigration seems to be a pain in the neck of the city’s plans as they refused the requests, admonishing the lack of personnel to supply the needs of our International Airport. Fed up with the heat of summer down at the bustling cities? Why not take a break and go to somewhere cooler and refreshing? 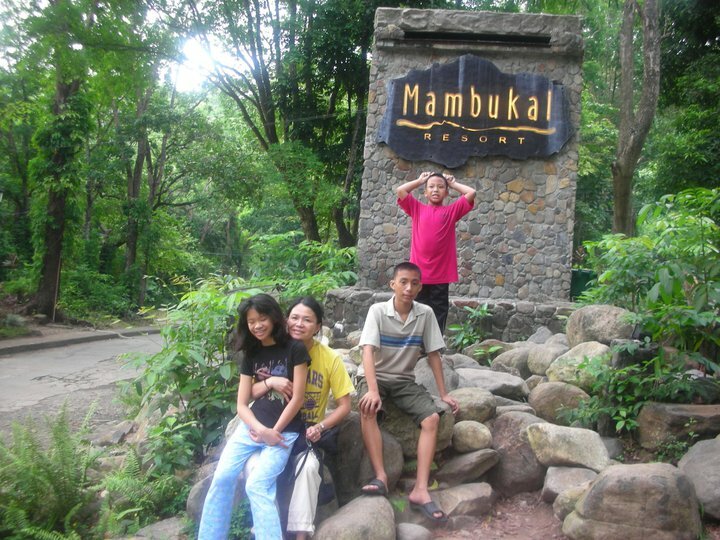 My family would always have a certain place as the top choice – Mambukal Resort. Mambukal Resort has been a household name in the City of Smiles. 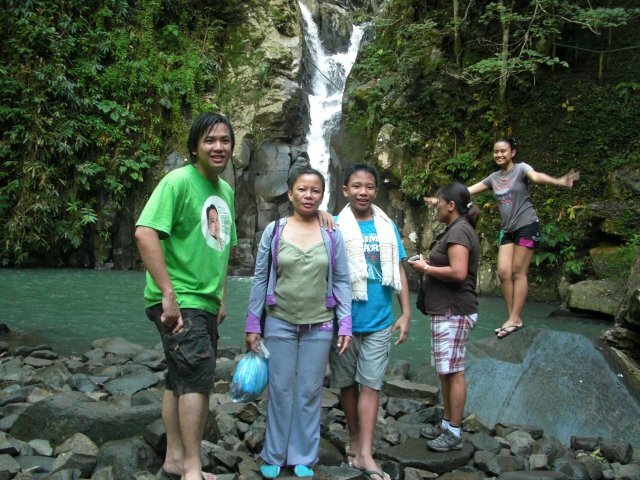 A trip to Mambukal has been a sort of nature pilgrimage for the family every summer when we used to live in the Bacolod City or every visit since we moved to Manila with relatives from the United States. Less than an hour‘s drive from the capital Bacolod City, Mambukal Resort boasts a wide array of attractions which includes the famed hot springs, cold springs, trek to the seven waterfalls, boating lagoon, green camping grounds, fruit bat sanctuary and a butterfly garden. 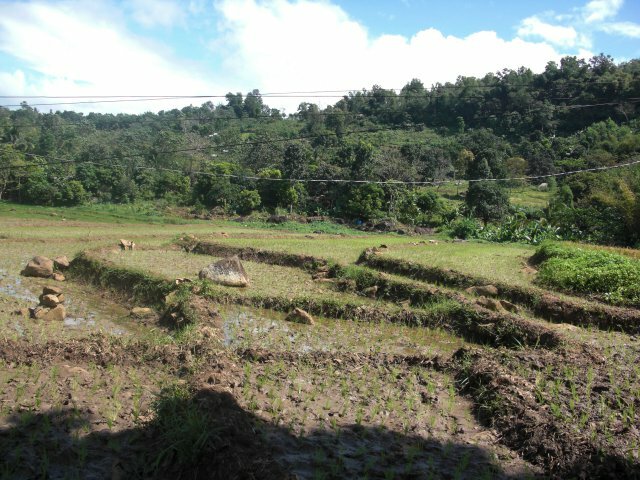 The whole property, while situated in the town of Murcia, is an independent resort township and is managed by the Province of Negros Occidental. In fact, there is a Governor’s Mansion in the secluded part of the resort which functions as the official retreat house of the Provincial Governor. 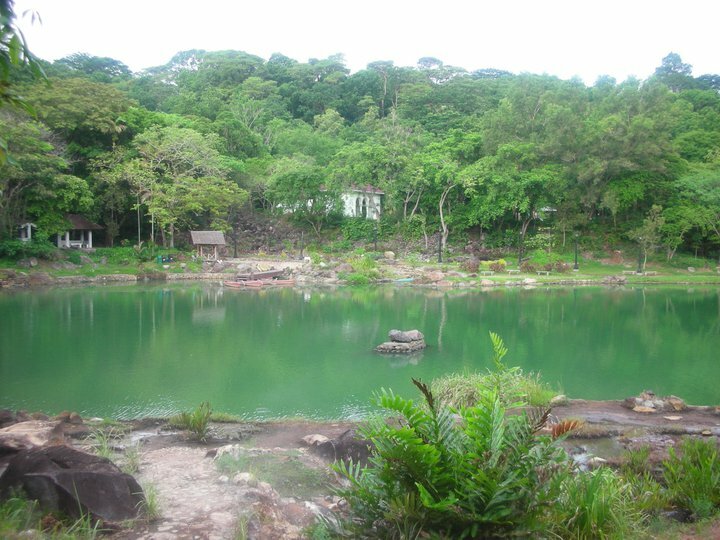 The best know feature of Mambukal Resort is the Hot Sulfuric Pool located near the Camping Grounds. 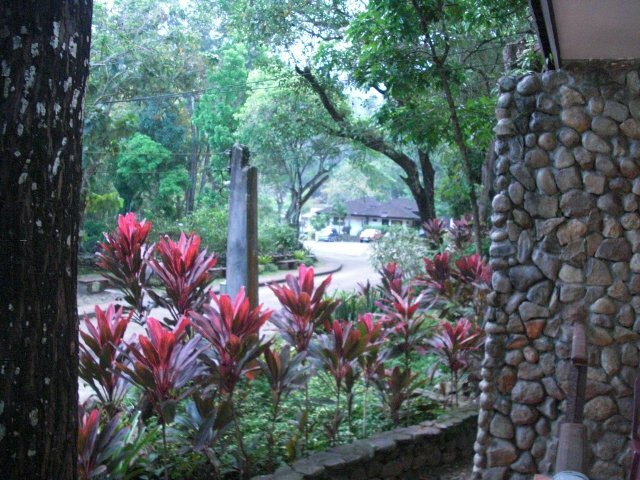 Mambukal Resort is one of the heat vents of nearby Mt. 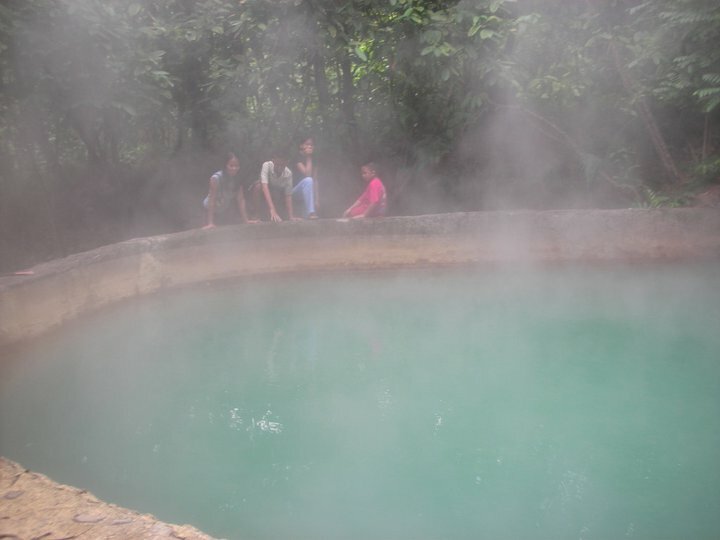 Kanlaon and the water at the sulfuric pool is boiling hot which can cook an egg. You would not try to mess up and fall in the pool for the extremely hot temperature at the bottom of the pool. Water from the Sulfuric Pool is channeled and cooled to bearable limits for the Dipping Pool. The high sulfur content of the red mud by the Sulfuric Pool makes for a good mud pack. 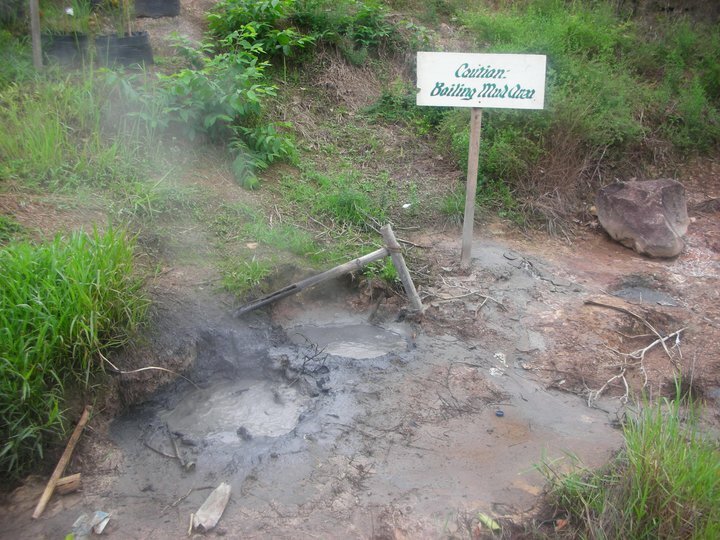 In fact, some tourists make it a point to take some mud for skin care use since sulfur mud is known to treat skin diseases and makes the skin soft and supple. 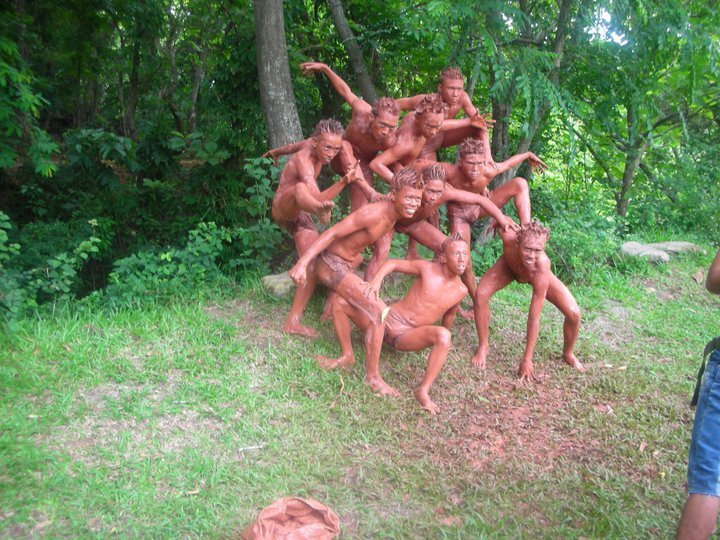 Mambukal Resort‘s sulfuric mud and its medicinal properties has so gained fame by itself that the resort-township has organized an annual Mud-Pack Festival every June. Local festival dancers take it to the streets and driveways of Mambukal for fanfare. 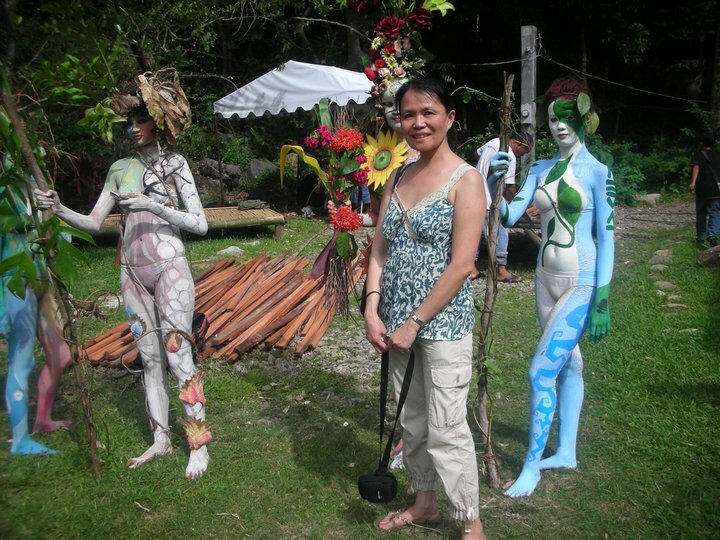 Models display artistic body paint works by local artists, drawing tourists in the normally lean season. Tourists are also welcome to be painted by local artists and join in a show of joie d’ vivre. 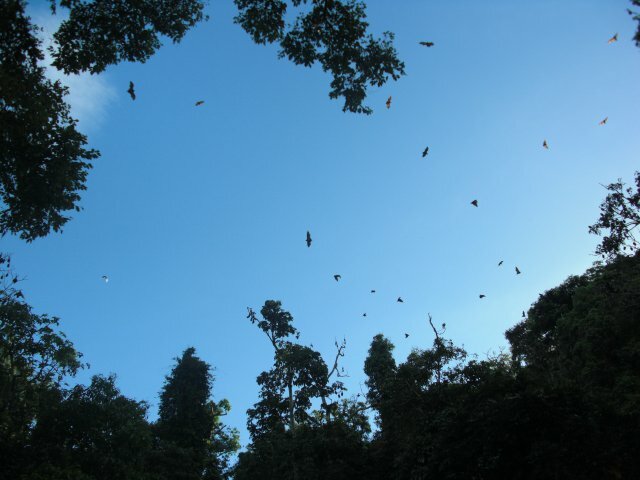 Did I mention that Mambukal Resort is also a sanctuary for the Philippine Fruit Bat or what we know as Flying Fox? 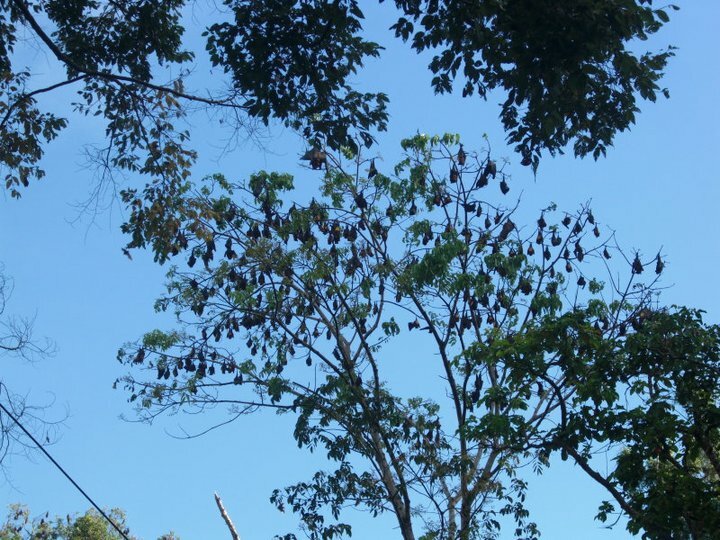 Bats are a common sight in Mambukal, perching on tall trees and their usual spots are those near the Dipping Pool by the Bridge which happens to be one of the areas where these bats have their dwelling and proven by the deposits and stench of guano. The small river under the bridge is actually an upland body of Bago River which finds its source up in the mountains. 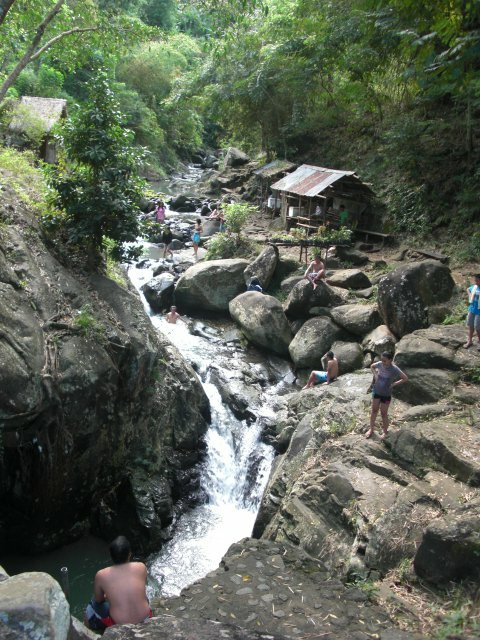 Tracing the source of Bago River, you will be led to another famed attraction of Mambukal Resort, the Seven Falls. 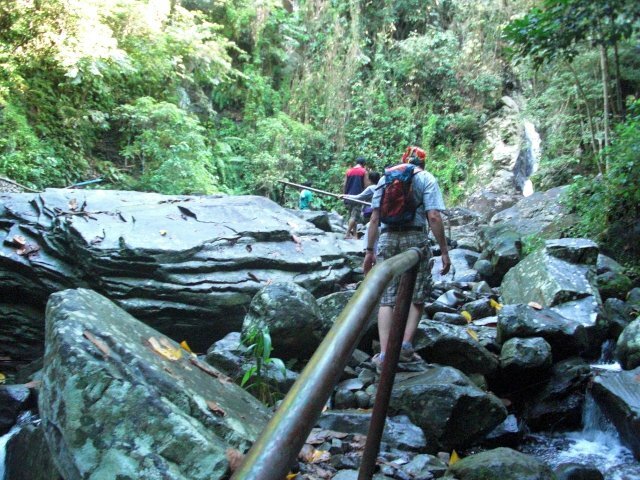 Mambukal Resort has a guided trail that will lead you all the way to the Seventh Falls up in the mountain. The trail is for those with solid stamina and have an adventurous heart since the trail is steep even though a path has been cleared. 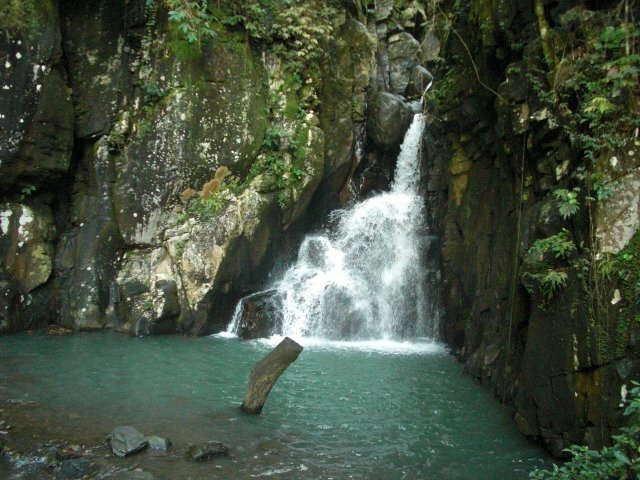 Even though the First to Fifth Falls are closer, a no-swimming policy is imposed since there are occassional rock slides from the top of the falls but swimming in the Sixth and Seventh Falls are allowed. The Sixth Falls is usually the last stop for most trekkers since the trek to the Seventh Falls would take a few more minutes up. 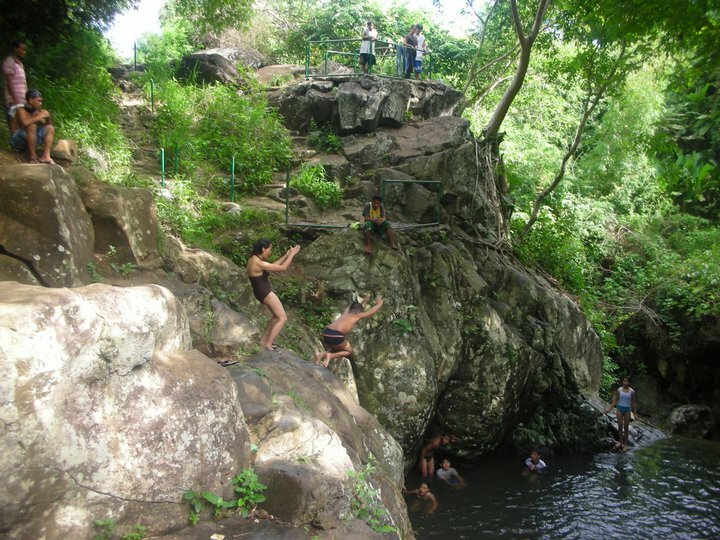 While the falls here is not as grand and big as the other falls, one feature that sets it apart is the natural pool at the bottom which is approximately seven to eight feet deep, making it appropriate for cliff jumpers. Those who are afraid of the height and depth would usually wallow instead at the shallow pool above the Sixth Falls. 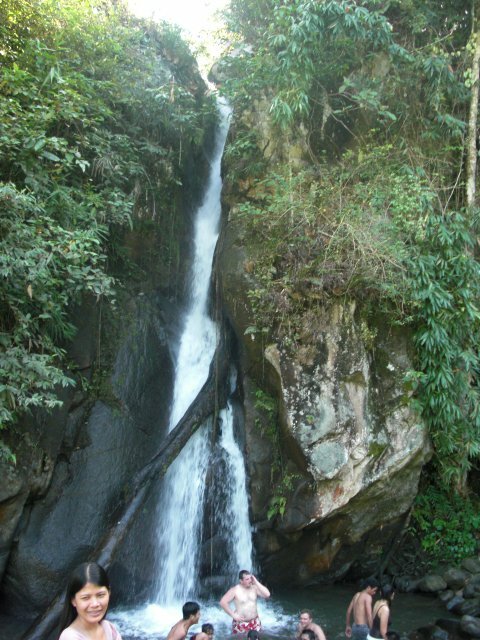 Mambukal Resort is all about adventure and it would not be real adventure until you have reached the Seventh Falls. This falls is the most isolated of the Seven Falls but the excellent view along the way is what makes it special. Unlike the previous trails, the trail leading to the Seventh Falls is situated in a flat plateau where a curious variety of plants grow. 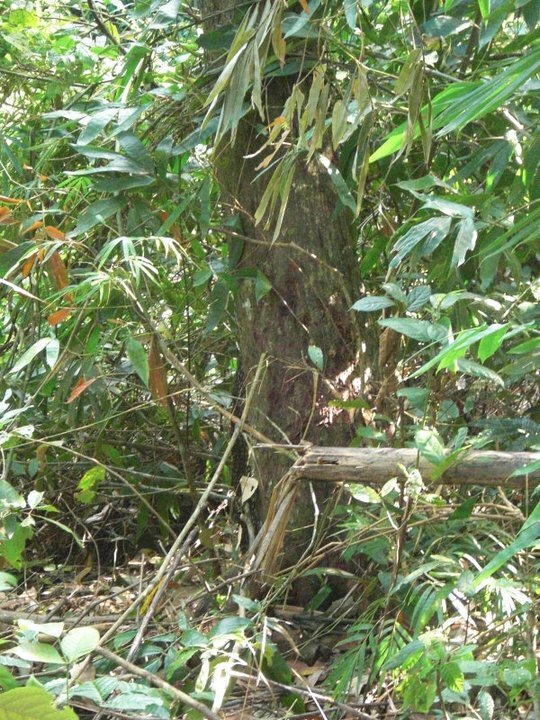 If you are lucky enough, you will be able to have sightings of forest creatures and some non-venomous snakes. The trail finally ends at the Seventh Falls and the advantage of it situated far from the rest of the falls is that there are lesser people except on certain days. Waters are cooler here, almost ice cold in fact since the falls is shaded the water is rushing fast to the other falls below. In some pockets, waters can reach up to six feet but most parts are just well within five feet. Even in its seclusion, the area is carefully guarded by the resort personnel to make sure no one would leave trash. If you happen to reach the Seventh Falls, do stay up to an hour or so to cool yourself down since its another hour’s hike back down. The hike back down to the main area of Mambukal Resort is in itself another experience worth taking. 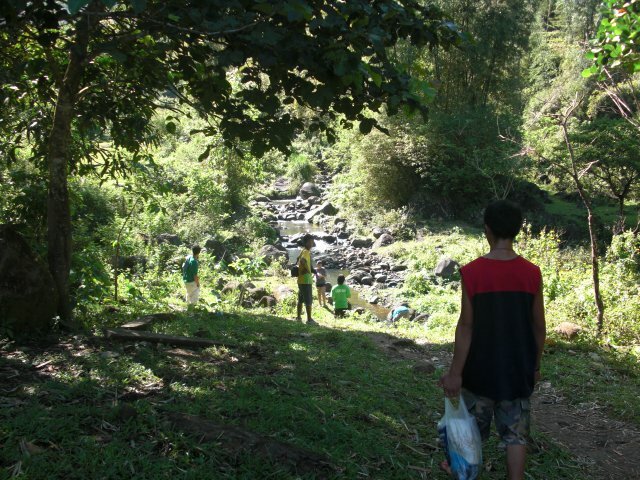 On your way down, you would pass by an upland community that is officially part of Murcia‘s Brgy. Minoyan. Some people ignore this part of the trek and hastily go back but I recommend staying by and enjoy native coffee among the residents. 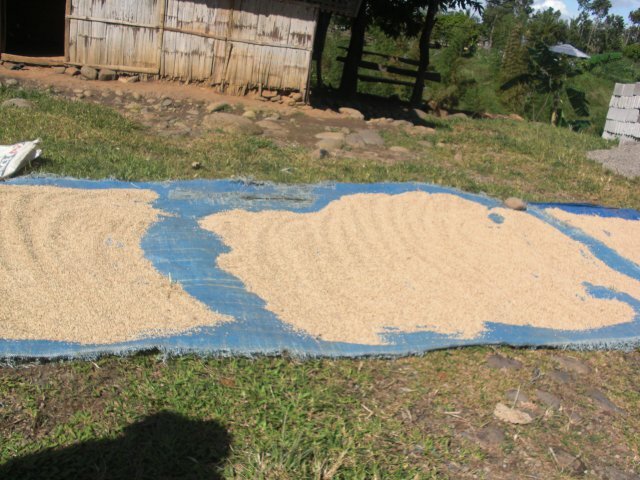 Rice is their main crop and some raise pigs for a living. Some do sell rice grains to passersby for a cheap price and those are organic produce, if you are lucky, you may be able to find red rice too. 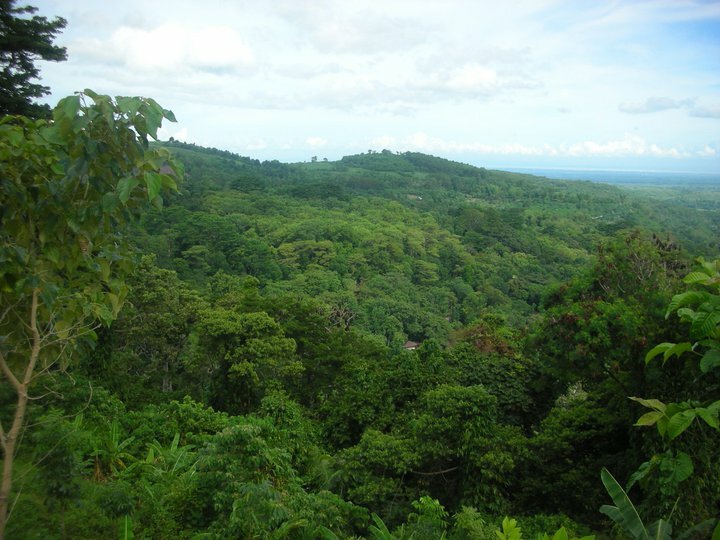 The plateau above the Mambukal Resort premises offers a good view of Bacolod and Talisay Cities by the Guimaras Strait. Curious attractions like the occasional beehives also dot the trail back down while there are rare sightings of green vipers and other kind of snakes by certain bamboo groves along the way. The end of the trail would lead you to the Boating Lagoon where you can rent a paddle boat or just simply stroll by the mini-dam. 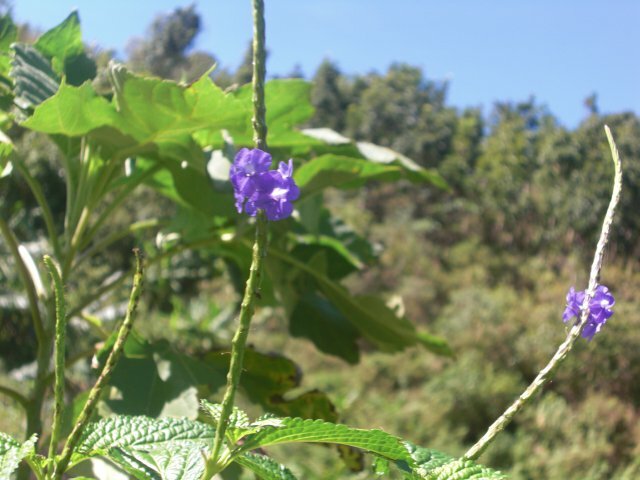 A wonderfully-kept Butterfly Garden is just nearby just below the mini-dam for those who wants to appreciate the different species of endemic butterflies bred in the facility. For those with endless energy, you may also try the Zip-line or what is called the Slide for Life at Mambukal Resort. There is also Rock Climbing spot for those who are in the mood to climb or a Canopy Walk for the view above the tree line. Mambukal Resort also has two swimming pools depending on your preference and proximity to your cottages. Over at the hot Dipping Pool, you may avail of the services being offered by the Blade Spa. If you want more privacy for a nice hot dip in a sulfur pool, you may opt to occupy a private pool inside the Ishiwata Bath House which actually is the oldest structure in the resort dating back to the pre-war American Era. The bath house was named after its Japanese architect, Kokichi Paul Ishiwata. If the nature and resort activities are just too much to accomplish in just a single day, you may stay in the cottages offered by Mambukal Resort for accommodation. If you want utmost comfort, you may opt for a Family Cottage which has two separate bedrooms with a hot and cold shower bathroom each and a formal receiving area. 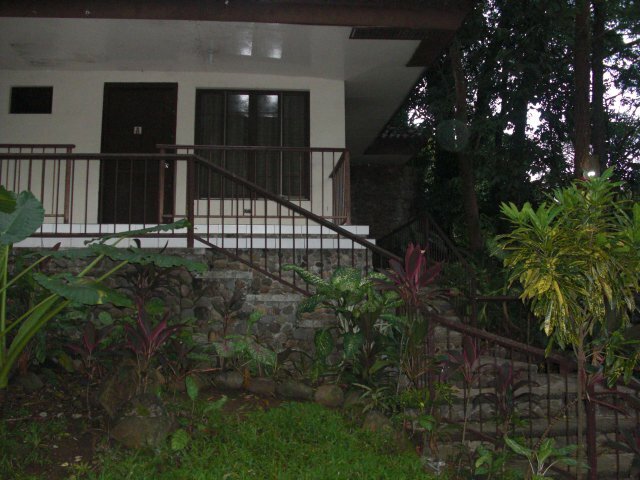 If you want a cheaper accommodation, you may opt for the LGU Cottage which is just a single room with beds side by side. Both cottages though are airconditioned and has a kitchen where you can cook your own food. Just book in advance since the resort is often full most of the year. Why suffer in the sweltering heat if you can just enjoy the lush green sceneries of the mountains? 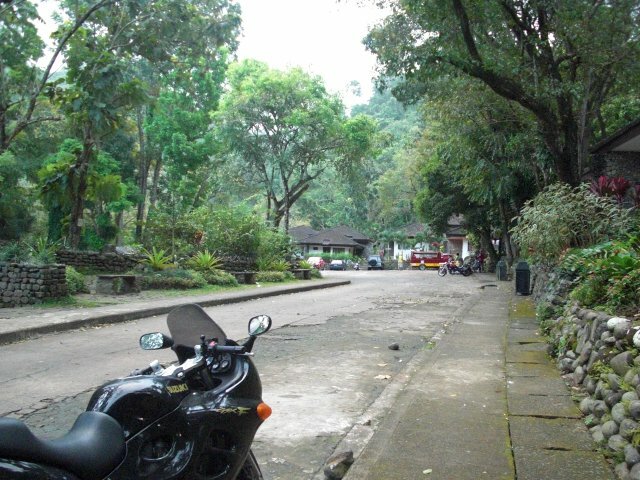 Mambukal Resort definitely remains a top destinations for both tourists and locals alike. The Province of Negros Occidental has recently launched the website of Mambukal Resort for more infos and photos that will surely entice you to come. The undying beauty of the place, the kind and accommodating staff would make you come back. 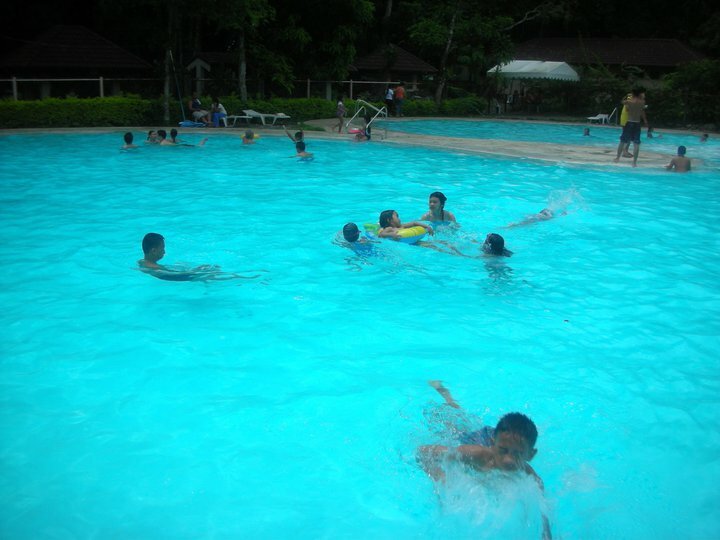 I hope to see you in Mambukal Resort in your next visit to Negros. 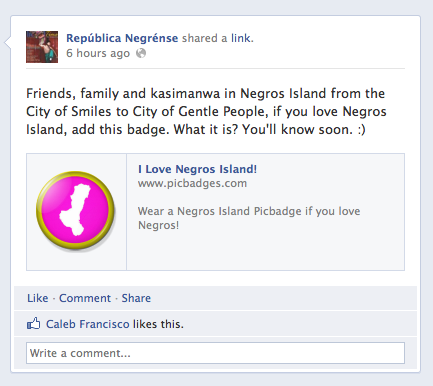 For your convenience, I posted the link to the Picbadge in the Facebook Like Page of República Negrénse. Just click on the link and it will take you to the site. I have posted some more updates since I posted that one but it will just be a few scrolls down and you will find the posts. More sure to “like” Repúblic Negrénse first and the post as well. 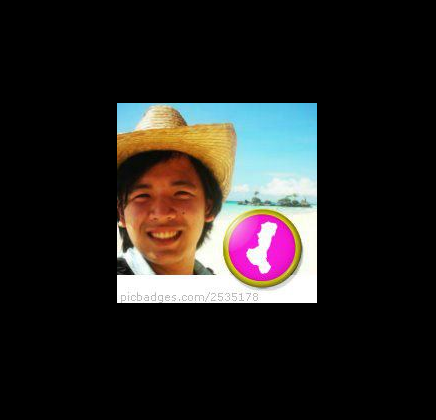 The landing page for the Picbadge site would be this one. Help promote the Picbadge campaign by clicking “like” for Facebook, “+1” for Google+ and “tweet” for Twitter. 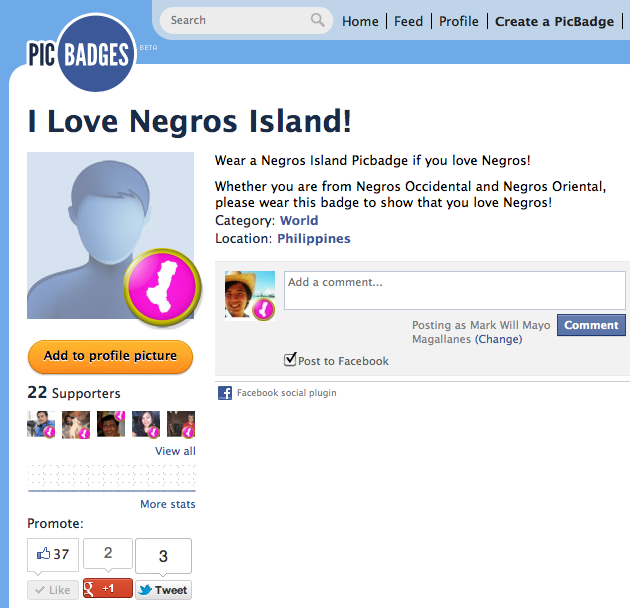 It would be best as well to add a little message on why you love Negros. 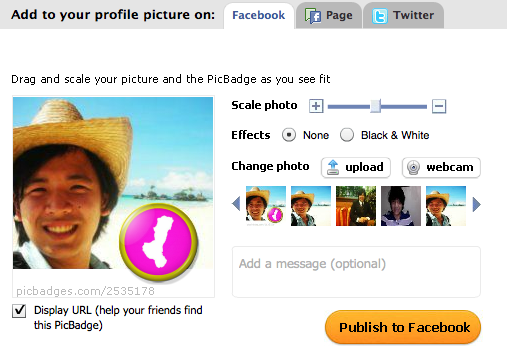 Click on “Add to profile picture” if you wish to add the Picbadge to your Facebook Profile Picture. 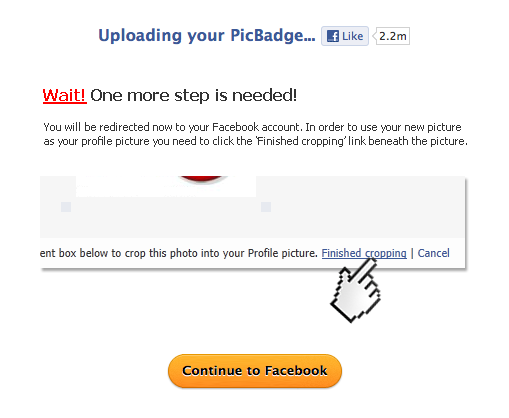 A pop-up screen will appear for you to make necessary adjustments to your Picbadge and Profile Picture. 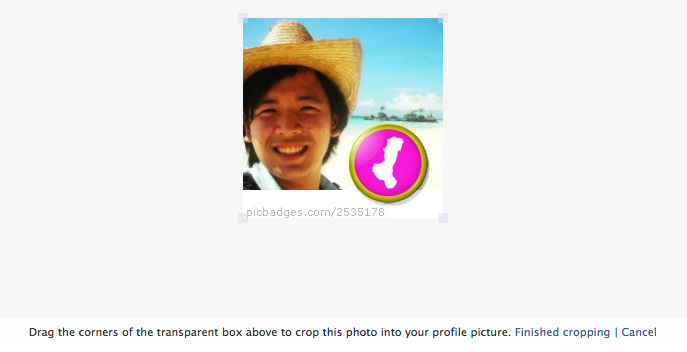 You will also have a choice to choose the Profile Picture that you think suits best with the Picbadge. If you want to align the picture properly, just drag your image and you may adjust the size with “Scale photo“. If you are ready, “Publish to Facebook“. After clicking “Publish to Facebook“, the pop-up window will lead you to this landing page. Just click on “Continue to Facebook” and follow the instructions that is seen on the screen. The “Continue to Facebook” button will lead you to Facebook. Just click “Finished cropping” and you are done. Do not forget as well to share this to fellow Negrenses from both Occidental and Oriental to show our love and support for our beloved island. Since it is summer, why not interest your friends as well to visit Negros? 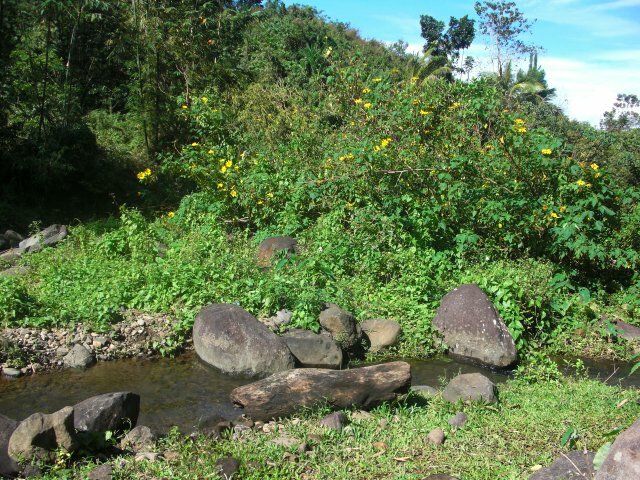 Just visit the Province of Negros Occidental’s Tourism Website for nice places to visit or read on this blog too.